Nowadays, most of people use pencils, ballpoints, or pen to write letters and other documents. Nevertheless, the art of calligraphy (shodo, 書道) that an ink-dipped brush is used artistically to write Chinese characters, hiragana and katakara, still remains an important part of Japanese traditional culture. 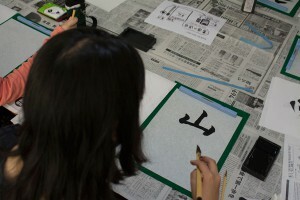 HdB held a Japanese calligraphy seminar on 30th May 2015, which was intended to introduce us the traditional Japanese calligraphic art and give us a special cultural experience. 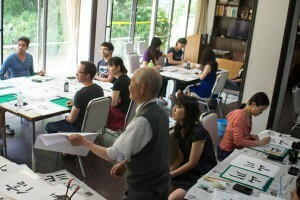 We invited Mr. Katsufumi HATAKENAKA, a professional Japanese calligraphy teacher who is working as a volunteer in Kyoto Prefectural International Center and other two calligraphy teachers to teach us the Japanese calligraphic art and skills. Teachers demonstrated a perfect calligraphy show. At first, they introduced the calligraphy set including brush, ink stick, liquid ink, ink stone, paper, paperweight and how to use them. Then the different character styles and the layout were also explained. Different types of calligraphy include regular script (kaisho, 楷書), which is used most commonly in modern writings and publications; semi-cursive script (gyosho, 行書), which is written faster and more loosely; and cursive script (sosho, 草書), a much freer, more fluid method where the characters’ strokes can bend and curve. Semi-cursive and cursive styles are less constrained and faster, where more movements made by the writing implement are visible. These styles’ stroke orders vary more, sometimes creating radically different forms. After explanation, everyone was guided to write several Chinese characters in the regular script 山川 (mountain and river), 平和 (peace), semi-cursive script愛 (love), 信 (belief, faith), and also cursive script笑 (smile, laugh). Then, taking a few hiragana as examples, teachers also illustrated how the Chinese characters could be transformed to hiragana, and showed the handwriting skill of a sentence including both Chinese characters and hiragana. 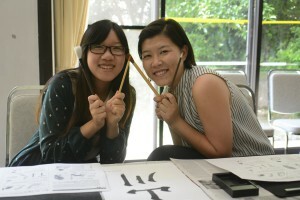 Many foreign residents asked teachers for a Japanese name in Chinese characters and wrote it down by brushes. Having a name in Japanese handwriting was the most interesting and fancy experience in this seminar. 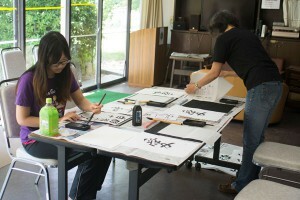 At the end, all of residents took pictures with their calligraphy works which they are most proud of. Thanks to House Parent and Higuchi-san who prepared curry rice, salad, fruits and sweets for us, we had a yummy lunch together with teachers. 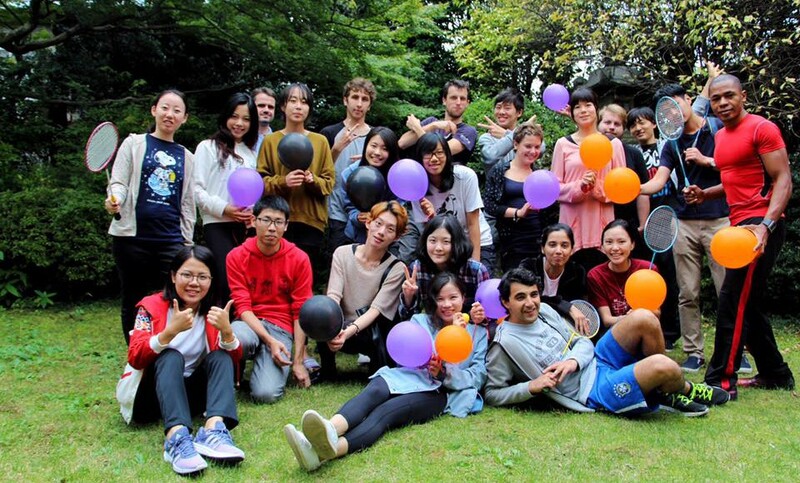 All participants were immersed in the charming atmosphere and pleasant communication.